I'm basically covered in freckles, so going to the dermatologist for an annual check to make sure there's nothing there that I should be worried about is not unusual. My doctor is great and she's got her special little hand held magnifying glass thing that she uses to check all over and look at individual spots that interest her. Like I said, I'm covered in freckles so the whole process takes awhile, which leaves us plenty of time to chat. As the conversation came around to em at one visit, I asked her three rather pointed questions. The first question was, "Is there any way at all to prevent stretch marks?" Her response was a resounding, "no," which I already knew. Unfortunately, though, there are many products available in stores everywhere that claim to prevent stretch marks; and these companies, I'm sure, make thousands upon thousands of dollars each year cashing in on that promise. However, it's simply not a promise that they can keep. To understand this a bit more clearly, though, you have to understand our skin. By nature, it's basically elastic like a rubberband. A new rubberband will stretch and spring back to its original shape without problems. However, skin loses it's elasticity in a number of ways, whether that be due to dry skin or age or any other number of reasons. Think of the rubberband again. If it's an older one, it may be dry with visible cracks in its surface and, if you try to stretch it, it will likely break. When the skin has lost it's elasticity and is then asked to rapidly expand due to weight gain, swelling, or, of course, pregnancy, the tissue under the skin can be pulled beyond it's ability to stretch. The result is scarring that we can see and call stretch marks. So, if you already have them, is there any way to get rid of stretch marks? I asked that very question of my doctor. "Is there any way, any way at all, to 'erase' them or make them go away after a person gets them?" I asked. Once again, I knew the answer even before I asked, but I let her answer anyway. Another resounding, "no." And, again, it's a shame that there are products and services out there claiming to remove them. The truth is, they may fade over time just like any other scar might, but they won't ever go away completely. And, as far as the claims of removing them by laser, those aren't true, either. The laser therapy only reduces the appearance of them by reducing their color. At this point, you may be thinking, "Great, well, I might as well just sit back and watch them appear since there's nothing I can do." Not so! This brings me to the third question I asked of my dermatologist..."Is there anything that a woman can do in the quest for a stretch mark-free pregnancy?" Although it is important to understand that your genes have a lot to do with whether you're body is predisposed to developing stretchmarks, you do have the power to minimize your chances of getting them. Like I said before, our skin is, by nature, elastic. The key to minimizing your chances of stretchmarks lies in maintaining the elasticity of your skin. Proper hydration from the inside and out is vitally important. Make sure you are getting plenty of fluids each day and make sure you're keeping your skin hydrated, too. Using a product like our body oil or body balm on a daily basis can help your skin regain and maintain the elasticity it will need when your belly begins to bloom. Equally important to remember is to begin this regime before your belly begins to blossom so that, if your skin does need to regain some elasticity, it has time to do so before the stretching begins. 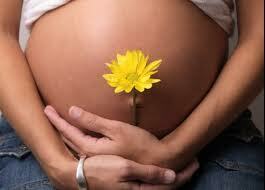 Treating yourself to a bellyfacial now and then is a great way to hydrate your skin throughout your pregnancy, too! I left the dermatologist that day with a clean bill of skin health and a renewed sense that, at em, we're offering women some great products to help them maintain beautiful, glowing skin throughout their pregnancies and beyond. If you still have questions regarding stretch marks, though, be sure to ask your doctor for his/her professional advice.